This series of sets are mainly used for producing the filmof LDPE, LLDPE and HDPE, which is the maximum fold-width of 600mm, 800mm and 1100mm, and the thickness of 0.006-0.03mm. In addition,the film is applied for civil and industry package, such as foodstuff, fruits, clothing and daily consumer goods etc. It is designed with compact structure and good outline, so it is convenient for maintance and operation. Screw and barrel are made of alloy steel with nitriding treatment. It is adopted with cast-aluminum heater to heat and air-cooling to regulate temperature, which has the advantages of automatic controlling, duration and reliability. 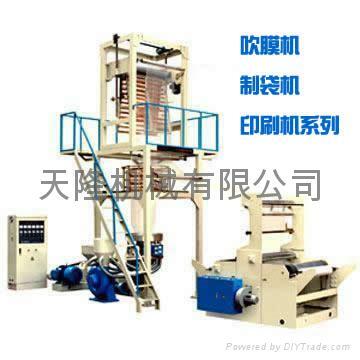 The ratio of L/D is large,and it is equipped with special mixing section, so it has goodmixing effect and large discharge. The hopper and outer cover made of superior steel have the advantages of bright tone and easy cleaning. Die structure is spiral mandrel type and equipped with screen changer which is convenient for operation,the die hasmore use and reasonable design and heated by cast-aluminum heater, so it can produce high quality film with smooth extrusion. It is adopted with steel shapes frame, the height of which can be adjusted,so convenient for operation. Many cut-open devices are available for customers to select. Winding-up device can be friction winding or center winding, so smooth for winding and convenient for operation. To increase film precision, rotary die is available, too.